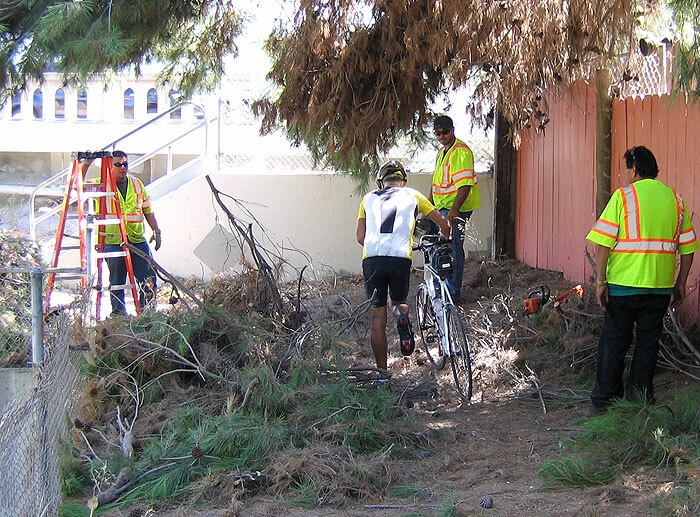 In the summer of 2011, Channel 8 reported a downed tree in Ocean Beach and the speediness with which the tree was being removed took under a day. Last Thursday, Jon Christopher reported a tree that was posing a danger on the popular Rose Creek Bike Path “by the crazy dismount section”. I reported it as did several others to the city’s Street Transportation Department. It’s not safe to ride a bicycle under a tree that shows signs of falling on you. @BikeSD @kevin_faulconer @codex_simplex North end of the path. By the crazy dismount section. @codex_simplex @BikeSD My team has notified City Street Division. Staff is investigating and will follow up. As of yesterday, the tree has still not been trimmed. Apparently when it comes to tree trimming to keep cyclists safe – this is a problem that has the folks at District 2 completely stumped. I went out to the Rose Creek Bike Path by Mission Bay Drive and Damon Street around 9:45 AM this morning (Friday) to trim the tree myself. I brought along my ladder and hand saws. When I got there, there was a reporter from Channel 6 shooting video and interviewing riders as they passed by. They laughed when I showed up. No, I’m not with the city. No, I’m not a hired contractor. Yes, I care about the city and yes, I care about the safety of Bike Path users. I started hacking away and made some decent progress in an hour or so. I’m no spring chicken and it was hot out there. The Cavalry arrived in the form of a city crew and I was glad to see them. The lead man introduced himself but I can’t recall his name. He was a good guy and his crew got right to it. I let them use my ladder which helped them to clear high into the tree branches. While his crew worked on the offending tree, he took up some loppers and proceeded down the bike path, clearing incidental out growth and pruning back shooters. That’s how you lead a crew! Kudos to our member for taking action and our thanks to the city crew for helping and being proactive with other growth. It should not have to come to the point our own members do the city’s work. How quickly would the city remove a fallen tree from a street? Attempts to reach the news station were unsuccessful but according to our member the segment will air on the 10pm broadcast. Update 3: The path is now passable.